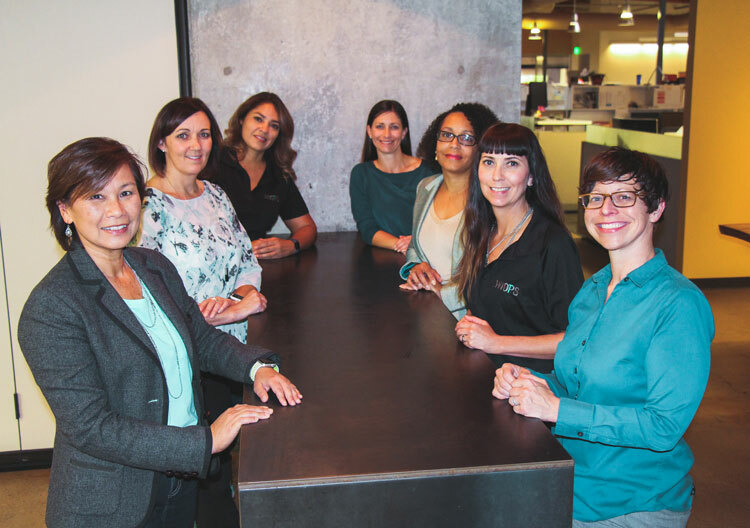 WiOPS Northern California Chapter Board Members — left side, front to back: Ha Le Khac, Jennifer Lauritzen, Christina Greystone; right side, front to back: Melissa Berg, Stacie McConnell, LaDrena Dansby, Marie Patterson. Absent: Kelly Coogan). Newport Beach, Calif. — Nearly five years after holding its first meeting in Southern California, Women in Construction Operations (WiOPS) will launch its Northern California Chapter during a free informational outreach event on Wednesday, January 17, 2018 from 5:00 p.m. to 8:00 p.m. Open to both women and men who serve in professional occupations within construction, architecture and engineering industries, the launch event will take place at Dome Construction in San Francisco. WiOPS, a professional organization whose mission is aimed at providing a forum to mentor and further the advancement of women in the building industry, has grown to nearly 600 members in Southern California since its first meeting on January 24, 2013. Following in the success and same format of the Southern California Chapter, WiOPS Northern California Chapter will hold future evening meetings on the last Wednesday of the month at member offices and various locations throughout the Bay Area. Sponsored by the hosting company, each meeting is free to attendees and will focus on learning, mentoring and networking through educational speakers, technical learning activities and social gatherings. “We have achieved more than we ever imagined when beginning WiOPS,” said Holly Cindell, project executive for Lendlease (US) Construction, WiOPS Governing Board member, and one of the organization’s 12 founding board members. “Five years ago, our board planned to have three events a year, and were unsure if anyone would attend. Our sights broadened when more than 150 people joined after our first meeting. Since that time, membership has quadrupled, and our SoCal meetings are booked through 2018 with A/E/C industry companies vying to host our events. To prepare for the launch of its new chapter, WiOPS began structuring its Northern California Chapter in May 2017. In November 2017, the Governing Board installed the following Board of Directors for the Northern California Chapter. Each member on the Board of Directors will serve three-year terms with officers serving in their positions for one year. In 2016, women made up only 9.1 percent (939,000) of the construction industry workforce in the United States, with just 31 percent (293,000) of that number in professional and managerial positions, according to statistics from the National Association of Women in Construction. While there are various other industry organizations for women in construction, none of them are tailored to women in construction operations. WiOPS is helping fill that gap. For more information about WiOPS, or to sign up to attend the Northern California Chapter launch event, visit https://womeninoperations.com/upcoming-events or email wiopsnorcal@gmail.com.